The Engel MT60-Combi is a large and powerful dual voltage combination fridge and freezer, with two separate compartments - one freezer and one refrigerator. 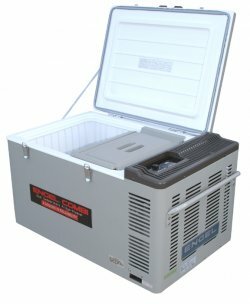 The fridge compartment is fixed at 40°F and the freezer compartment features variable temperature regulation from 40° down to below 0°F. Our drivers have been very satisfied with their new refrigerators. Hookup was no problem and power use is very low. Nice unit all around! This being our third Engel portable refrigerator we knew what to expect. The first two have been in use for just over 6 years and they're still running strong. If the past is any indication of the future I know that this portable fridge/freezer will serve us well for many years to come.